Draft: 2012, Seattle Mariners, 3rd rd. 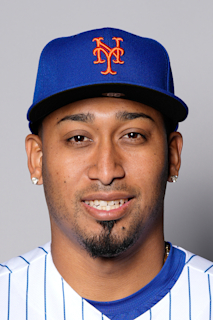 Selected by Seattle in the third round of the 2012 MLB First-Year Player Draft...Acquired by the New York Mets from Seattle along with INF Robinson Canó and cash considerations in exchange for OF Jay Bruce, RHP Anthony Swarzak, RHP Gerson Bautista, RHP Justin Dunn and OF Jarred Kelenic on December 3, 2018. Was named the Mariano Rivera AL Reliever of the Year and earned AL All-Star honors for the first time in his career...Finished eighth in the AL Cy Young Award balloting...Also received five votes for the AL MVP Award and finished 18th...Was a four-time AL Reliever of the Month honoree, taking the award in April, June, July and August...Was the first non-rookie to win at least four monthly awards in a season since Pedro Martinez earned four AL Pitcher of the Month honors in 1999...Went 57-61 (93.4 percent) in save opportunities, while posting a record of 0-4 with a 1.96 ERA (16 earned runs/73.1 innings) with 124 strikeouts and 17 walks in 73 relief appearances with the Mariners... Successfully converted 28 consecutive save opportunities from June 2-August 15…Was the longest streak in the majors in 2018...Led the majors with 57 saves, tied for the second-highest single-season total in MLB history...Only Francisco Rodríguez (62 in 2008) has had more in a season...Ranked second among all relievers with 124 strikeouts…Among AL relievers, ranked first in WHIP (0.79), second in opponents OBP (.229), third in K/9.0 IP (15.22), third in ERA (1.96), fourth in opponents slugging percentage (.241) and fifth in opponents average (.160, 41-257)...His 3.5 Fangraphs WAR was the seventh-highest by a reliever since the 2000 season...The Mariners went 66-0 when he entered the game with a lead…went 61-0 in his save opportunities…went 30-0 when he entered with a one-run lead...Díaz was 27-30 in one-run save opportunities with a 0.89 ERA (three earned runs/30.1 innings) with 55 strikeouts and 5 walks... According to STATS, his 27 one-run saves were a single-season MLB record...Led AL relievers and ranked second among all relievers with 124 strikeouts...Struck out 44.3 percent (124 strikeouts/280 BF) of batters he faced in 2018, the second-best mark among all relievers behind Milwaukee's Josh Hader (46.8 percent - 140 SO/299 BF), the third-best mark by a reliever in AL history and seventh-best by a reliever in major league history…Fanned his first batter faced in 34 of 73 (46.6 percent) appearances in 2018, the top mark among all relievers...Went 5-5 in save opportunities with a 1-0 lead... In those five outings, he threw five 1-2-3 ninth innings, striking out 14 of the 15 batters he faced… his 5 saves in 1-0 wins are tied with 4 others for the most in single-season history since the save became an official stat in 1969 (also: Troy Percival-LAA, 2002, Heath Bell-SD, 2010, Carlos Marmol-CHC, 2010, and Trevor Rosenthal-STL, 2014)...Whiffed eight consecutive hitters on two occasions, July 3-11 over four games and September 1-5 over three games...Is the second pitcher in MLB history to compile at least 50 saves and 100 strikeouts in the same season...Eric Gagne, who did so in consecutive years (2002-2003), is the only other pitcher to do so...With 124 strikeouts and 17 walks, became only the 18th reliever in Major League history with a season with at least 100 more strikeouts than walks...Josh Hader (143 strikeouts, 30 walks) also accomplished this feat in 2018...Retired all three batters faced in 33 of 69 (48 percent) appearances of exactly 1.0 inning...Was the winning pitcher in the 2018 All-Star Game...Recorded his 50th save of the season on August 25 at Arizona…Came in the Mariners' 130th game of the season, becoming the secondfastest pitcher to reach the milestone (Francisco Rodriguez, 129 games, 2008)...Recorded his 300th career strikeout on September 29 vs. Texas...Became the fifth reliever in MLB history with at least 300 strikeouts over his first three major league seasons. The Totals - Went 0-4 with 18 saves (in 21 opportunities) with a 2.79 ERA (16 ER, 51.2 IP) with 88 strikeouts in 49 relief appearances...Closing Time - Was 0-2 with 18 saves (in 21 chances) with 3.71 ERA (11 ER, 26.2 IP) with 39 strikeouts after move to closer role Aug. 1...Save It - Went 0-1 with 18 saves with a 4.22 ERA (10 ER, 21.1 IP) with 33 strikeouts in 21 games when entering in a save situation...Leading the Way - His 18 saves from Aug. 1 through the end of the regular season led MLB, ahead of Mark Melancon-WAS (17), Sam Dyson-TEX (16) & Kenley Jansen-LAD (16)...Strikeout Record - His 15.33 strikeout per 9.0 inning rate is the best in club history (min. 50.0 IP), ahead of Danny Farquhar (12.77 in 2013)...The Setup - Went 0-2 with 13 holds and a 1.80 ERA (5 ER, 25.0 IP) with 49 strikeouts in 24 games before moving to closer role (through July 31)...Close the Door - Converted first 11 save opps (8/2-26), and 7 of last 10 to end season..Punch-Outs - Recorded 88 strikeouts, 3rd-most in club history by a Mariners rookie reliever behind Enrique Romo (92) and Carson Smith (92), and T8th-most in club history by a reliever (also: Jeff Nelson, 88 K, 2001)...First Save - Earned his first ML save and struck out 3 on Aug. 2 vs. Boston (1.0 IP, BB, 3 K)...That's A Record - Recorded his 50th career strikeout in 25.1 IP, the fastest of any pitcher to make his Major League debut since 1893 (Elias Sports Bureau)...High Rates - Struck out 15.33 batters per 9.0 innings, the 2nd-best rate among relievers behind New York's Dellin Betances (15.53) and 8th-best in MLB history…ranks 2nd-best by a rookie reliever in MLB history, trailing Kenley Jansen-LAD (16.10/96 K, 53.2 IP, 2011)...Yer Out - Struck out 2+ batters in 29 of 49 outings and had at least one in 42 of 49 games...Mowing 'Em Down - Recorded 11 straight outs via strikeout June 28-July 6, setting a club record (previous: 10, Randy Johnson, July 18-24, 1997)...Distance - Season-bests with 5 strikeouts and 2.2 shutout frames June 14 at Tampa Bay...Call-Up - Selected from AA Jackson June 4…MLB debut June 6 vs. Cleveland (1.0 ShO IP, 1 K)...With Jackson - Went 3-3 with 1 save and a 2.21 ERA (10 ER, 40.2 IP) with 54 strikeouts in 16 games including 6 starts with AA Jackson...Minor Pen - After move to bullpen May 10, was 1-0 with 1 save and 0.00 ERA (0 ER, 11.2 IP), striking out 16...Starters - Began season in rotation, was 2-3 with 3.00 ERA (10 ER, 30.0 IP) with 38 in 6 starts. Split season between High-A Bakersfield (4/9-5/12) and AA Jackson (5/13-end of season), going 7-10 with 3.82 ERA (60 ER, 141.1 IP) in 27 starts…member of World Team in 2015 MLB Futures Game (0.2,3,2,2,0,1)…named by Seattle Mariners as the organization's Starting Pitcher of the Year…led Mariners farmhands with 145 strikeouts… among all minor league players ranked 9th in strikeouts per 9.0 innings (9.23) and T13th in strikeouts (145)…went 2-0 with a 1.70 ERA (7 ER, 37.0 IP) in 7 starts with Bakersfield (April 9-May 12)…at the time of promotion to AA on May 13, ranked among the California League pitching leaders in opponent batting average (1st, .167), WHIP (1st, 0.81), ERA (3rd, 1.70), strikeouts (5th, 42) and innings (10th, 37.0)...the Mariners #2 prospect by Baseball America heading into 2016 season. Spent season with Clinton and named by Mariners as Starting Pitcher of the Year… allowed 2 earned runs or less in 17 games, including not allowing a run in 6 starts. Made 13 starts with Pulaski…Appalachian League Pitcher of the Year…ranked among league leaders in ERA (1st, 1.43), strikeouts (1st, 79), starts (T1st, 13), innings (2nd, 69.0), WHIP (1st, 0.91) and opponents average (2nd, .191) and among starters in strikeouts per 9.0 innings (3rd, 10.30) and fewest baserunners per 9.0 innings (1st, 8.74)…Appalachian League Pitcher of the Week, June 24-30…participated in Mariners Instructional League. Began pro career with AZL Mariners…participated in Mariners Instructional League. Which player had the best debut with his new team on Opening Day? June 4, 2016 Seattle Mariners selected the contract of RHP Edwin Diaz from Jackson Generals. July 14, 2015 Jackson Generals activated RHP Edwin Diaz from the temporarily inactive list. July 11, 2015 Jackson Generals placed RHP Edwin Diaz on the temporarily inactive list. May 13, 2015 RHP Edwin Diaz assigned to Jackson Generals from Bakersfield Blaze. April 7, 2015 RHP Edwin Diaz assigned to Bakersfield Blaze from Clinton LumberKings. October 30, 2014 RHP Edwin Diaz assigned to Cangrejeros de Santurce. October 30, 2014 Cangrejeros de Santurce placed RHP Edwin Diaz on the reserve list. April 1, 2014 RHP Edwin Diaz assigned to Clinton LumberKings from Pulaski Mariners. June 19, 2013 RHP Edwin Diaz assigned to Pulaski Mariners from AZL Mariners. June 14, 2012 Seattle Mariners signed RHP Edwin Diaz. June 14, 2012 Edwin Diaz assigned to AZL Mariners from Seattle Mariners.